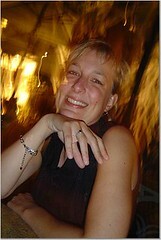 The photograph on the left has been added to this post after publication. We've reposted this recipe with brighter, better pictures! Check them out here. Hm, we don't actually know what to call this. 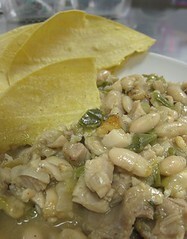 Is it a "White Chili" because it uses white meat and white beans? Or is it called a "Green Chili" because a prominent flavour is that of green chili peppers, as opposed to red smoky ones? Whatever its name is, it was quite delicious. We made this one night, late at night, for lunch the next day. We didn't start with white-white meat (aka breast of chicken), but instead with chicken legs. We had about six pieces of unmarinated chicken legs left over from one of our Thai fried chicken nights. Why I left six pieces unmarinated and unfried, I don't know -- perhaps I was being demure in not wanting to eat a lot of Thai fried chicken. I browned the chicken legs in some oil. While the chicken legs were browning, I diced up one onion, minced about 3 cloves of garlic, and chopped up a couple of Anaheim peppers, a couple of jalapeño peppers, and a couple of serrano peppers. When all the chicken pieces were browned, I set them aside and drained the excess fat from the pan. After which, in went the onion first to be sweated until translucent, or even past that, with a hint of brown. I stirred in some ground cumin (about 1 tbsp or to taste, as I like mine to be more cumin-y) with some oregano (Mexican oregano is best, about 2 teaspoons' worth) with the onions to caramelize lightly. Then in goes the garlic, then the all the peppers. Back in there went the chicken and about two cups of chicken stock (we happened to have some lying around, because we had a poached chicken for dinner that night). I also opened up a couple cans of white cannellini beans. Joining our little pot o' chili are about 4 to 6 cloves, two sprigs of thyme, and a bay leaf. Let all of the ingredients stew for a while, until the flavours have melded. This is important because I made the mistake of not letting the mixture stew together for some time when we did a tofu-and-white-bean version of this. In my haste to eat, I just plopped everything in the pot for a short time, so when I bit into the tofu and the white beans, they still tasted so bean-y. But I'm getting ahead of myself. After stewing for a bit (let's say, 45 minutes), I took the meat off the bone for all the chicken legs. To finish, I toasted some whole cumin seeds on the side and put them on top, just before serving. I love the flavour of whole cumin seeds. We had some corn and flour tortillas on the side. While I normally prefer corn tortillas, in this case, the flour tortillas worked a little better with the flavours. While normally we would've eaten this as is with the tortillas (or rice), we had to find some way to neutralize the heat. IT WAS SERIOUSLY HOT. H! O! T!!!! JS went a little overboard with the peppers. I mean, jalapeño peppers and serrano peppers -- both plural -- for 6 measly chicken legs! I think the Anaheim peppers were also hot. I didn't expect the Anaheim peppers to be that hot, which is why I doubled up on the jalapeño and serrano peppers. Enter our Lemon Feta Dip. We made this Lemon Feta Dip -- creamy drained yogurt and mayo, with lemon juice, feta cheese and mint, among other things -- on the same night as the chili, trying to quickly make something for First Thursday (at Thursday Night Smackdown). What great timing. This cool, tangy dip was the perfect way of preventing us from burning our mouths from the chili. 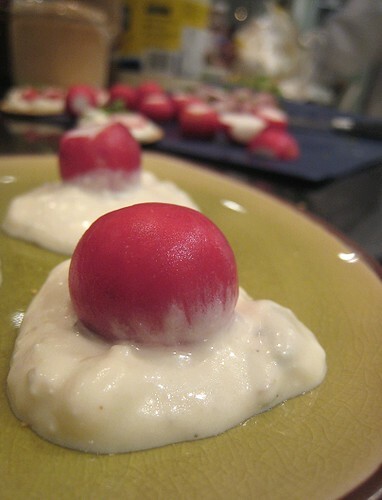 Since we had radishes prepped as well, I discovered that the radishes were also good for said burn prevention. They may not look like much, but these two guys were heroes. 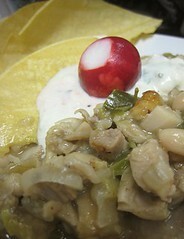 I'm sorry my pictures are so ugly, because this white or green chili was really, really good. The photos do not represent them fairly at all. I blame the lighting at the workplace! 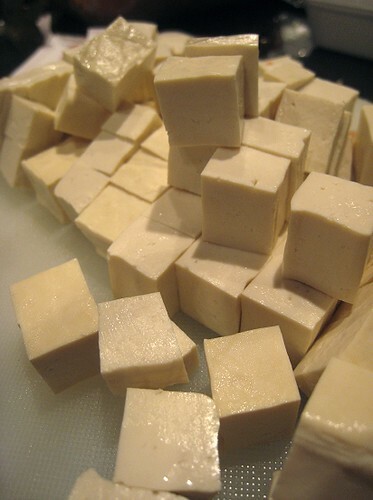 Still high from the first chili (must be all those endorphins released), but not having any other protein on hand, we decided to make a tofu version a few days later. As JS mentioned, the tofu version did not get to simmer in her haste, so the tofu pieces weren't as flavorful as they could have been. (Or are we just biased carnivores?) But, it also definitely works. 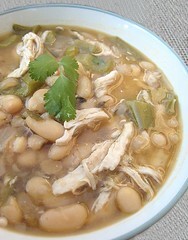 Try this White Green White White-Green Chicken Chili, despite the lackluster photography. 1. Heat 2 tbsp of vegetable oil in a skillet. Brown chicken legs. 2. Take out and set aside chicken legs. Drain excess oil. 4. When onions are translucent, add ground cumin and oregano and cook with onions until lightly brown. 5. Add garlic. 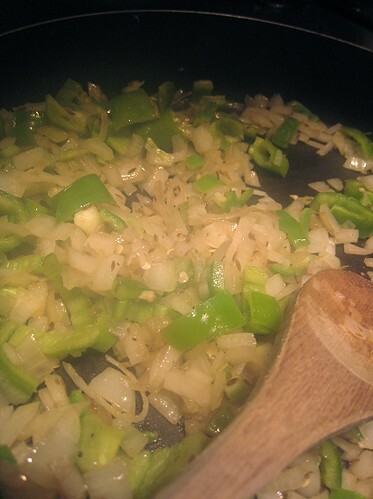 When fragrant, add the Anaheim peppers, serrano and jalapeño peppers. 6. Add the cannellini beans. 8. 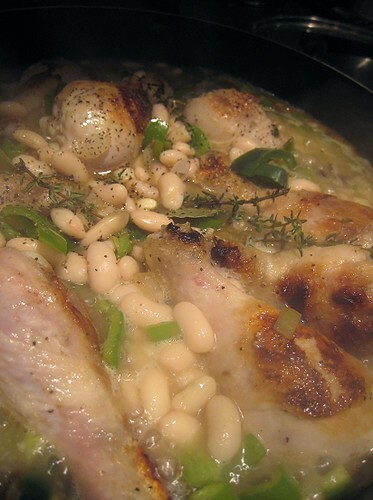 Put back the chicken legs and add the thyme, bay leaf and cloves. 9. Simmer until chicken legs are tender, about 35-45 minutes. 10. If desired, debone chicken legs and put back the shredded chicken meat into the pan. 11. Stir in the chopped cilantro. 12. Serve with flour tortillas warmed up. I like that you used chicken legs in this chili since I find it one of the more flavorful cuts! I bet thighs would work well too!! This looks delicious! Now I'm craving chilli. I've never had a white (or green) chilli before, but I'm game to try it. What's in a name? Delicious is what counts. Hi TS - After making a version several weeks ago....I'm still not certain I know what whilte chili is? Yeah. Go, dark meat! =D We just happened to have the drumsticks on hand. It's very nice. Try it, try it! I don't think it has to be hot. But of course, the heat also makes it good. I think we would stick with calling it "White or Green Chili", hehe. I was impressed with all those chilis! I never go over one or two. That chili looks really good!